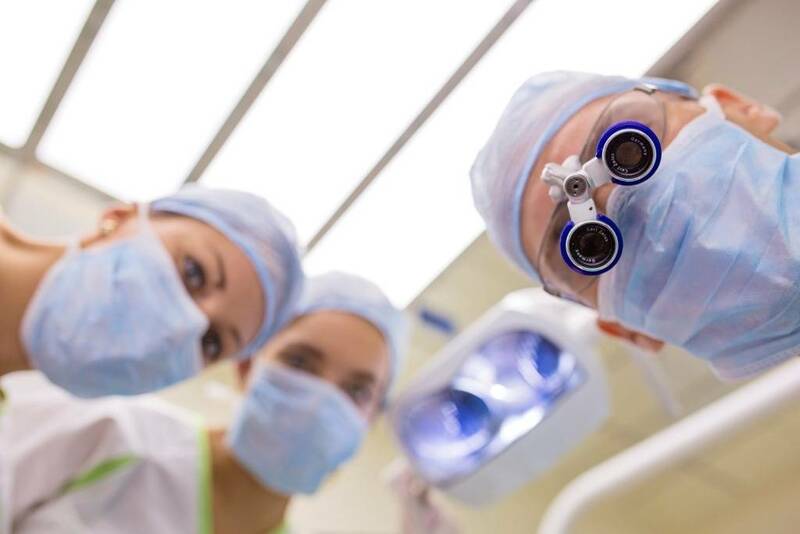 Oral surgeries - Poncz Dental fogászati rendelő és precíziós szájsebészet. Although our objective at the clinic is always the preservation of your original teeth, sometimes it is impossible. Teeth with retarded eruption (impacted, retineated) mainly require surgery. Tooth replacement through one of the greatest solutions of our time –dental implants – is also considered oral surgery. Of course, in our clinic pain free dentistry is a fundamental principle, so you will not feel any discomfort during treatments. Our experience and clinical background guarantees the success of complicated treatments. Dental implantation replaces missing teeth by inserting an artificial root into the bone. It is a routine surgical treatment performed in the everyday denstist’s office under local anesthesia. It is a good solution for replacing one missing tooth and also in case of a completely edentulous jaw. It greatly improves the quality of chewing thus making everyday life more comfortable. State-of-the-art techniques make it possible to perform bone grafting in order to reach perfect aesthetic results when there is not enough available bone volume. It is now a routine, completely painless procedure that contributes to a long-term aesthetic solution. Our clinic uses Geistlich Bio-Oss bone substitute. When the bone quantity in the upper molars area is insufficient for insertion of an implant, this surgical intervention can create the necessary volume. The sinus lifting procedure often makes implantation possible in cases previously not considered implantable. This is a routine surgical treatment, involving removal of the inflammation around a root apex that isn’t healing. It often happens that certain teeth do not erupt, or erupt only part way. In this case their surgical removal is recommended to avoid endangering the surrounding teeth. Patients often come to us with complaints about the mobility of their teeth, though they are not experiencing pain. In these cases X-rays provide us with information we need. Loose teeth are often the indication of chronic periodontal disease (bone reduction), which is treated with conservative surgical pocket therapy. Problems of the mucous membrane, notably mouth ulcers, are relatively frequent diseases of the oral cavity. A mouth ulcer may be induced by viral infection, allergy or neural factors. It is often coupled with weakness of the immune system. It is a small white vesicula surrounded by an inflamed halo on the mucosa, and is accompanied by burning pain. Trush, a mycotic disease of the oral cavity is also frequent. It is caused by a candida infection occuring on the skin and on the mucous membrane. Candida is always present in the body and may proliferate when there is a biological imbalance. It may develop during a longer antibiotic therapy as well. Trush appears in the form of white spots on the tongue and on the mucosa of the oral cavity, accompanied by sensitivity and pain. It may also occur when a removable prosthesis is not properly maintained. Mucosal lesions are treated by systemic or topical medication or, if necessary, with laser therapy. Patients often come to us with pain around the ears, pain during chewing, or because of a clicking jaw joint. These can be symptoms of various disorders. First, we explore the origin of the pain, then we solve the problem with the appropriate treatment. Bite lifting, splints and pain killers are amongst the solutions in these cases.